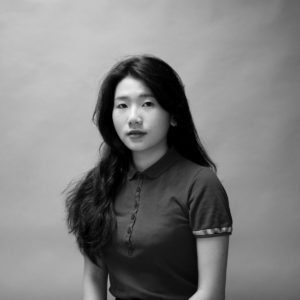 Ziwen Qiu is a Graduate student in College of Textile, whose background is fashion design and engineering. She works hard in professional study, completing her knowledge learning of Bachelor degree in Shanghai Donghua University within 3 years. She spent her childhood in Shanghai where she grew her curiosity to the world. She has traveled to European and Asian countries for several times. Being engaged in fashion design is a way to present her understanding from her experience. Oriental New Blood is an East Asian street style women’s collection for SS18. It targets the group of generation Z, the young women born between 1995 and the early 2000s. The loose look, with oversized items and details, have been trendy in recent years, presenting the love of leisure and sports styles, the feeling of insecurity and the eagerness for self-expression among the post-Millennials. The color palette and the motifs are inspired by Japanese tattoos, hitting the trend of eastern culture broadcasting. The woven fabric used consists of printed charmeuse silk and cotton twill to obtain most draping shape and some stiff outline. The pure colored knit looks are produced by the whole garment knitting machine.